And already, people are figuring out successful ways of pushing back against privatization. Water is an essential natural element, but around the world, it’s also an artificially endangered resource. That would explain why the nations represented at a recent international conference on water rights in Lagos ranged from remote desert towns with hand-pumped wells to modern public utilities in European cities. Precisely because water is universally in demand, it faces boundless threats of exploitation, in countries rich and poor. As we reported previously, Lagos has become ground zero for the global water-justice movement, as the city’s residents battle against a pending so-called Public-Private Partnership (PPP). This “development” model, promoted globally by neoliberal policymakers, lets governments contract with private companies to finance investment in water infrastructure, and then funnel them proceeds from future operating revenues. Public-Private Partnerships in the water sector are not the solution to the water challenge, but rather a new form of colonialism aggressively marketed by the World Bank and its corporate partners, that defines success in terms of profit rather than universal affordable water access. Nigeria’s water battles tap into the same frustration that engulfed the Greek seaport city of Thessaloniki last May. Well before the landmark “NO” referendum on the troika’s austerity deal, residents held a plebiscite on a plan to fully privatize its waterworks. Local activists rallied against the agenda of the government’s privatization authority to place the management of the quasi-public municipal water utility under total private management. Though squeezed by austerity pressures, citizens initiated a grassroots campaign to run a non-binding referendum on the proposal, despite pushback from the Athens authorities, who condemned the initiative as “illegal.” Ultimately, of about 218,000 voters, 98 percent voted against the plan, sending a defiant message that, whatever the financial cost, their water was not for sale. Because water is universally in demand, it faces boundless threats of exploitation, in countries rich and poor. Greece’s water wars (which may be revived under the latest austerity push) have revealed how the Great Recession has blurred divides between Global North and South. According to TNI’s analysis of water reform efforts, both “first-” and “third”-world problems are converging in movements for the “remunicipalization” of water systems in diverse cities including Berlin, Kuala Lumpur, and Buenos Aires. Municipalities have dismantled contracts with commercial vendors generally either through a political process or just letting contracts lapse. In Nagpur, India, according to a Corporate Accountability International report, French multinational Veolia tried to launch a model PPP plan with the support of World Bank financing, but the grand plans to build out and maintain the water infrastructure were eventually poisoned by cost overruns, corruption scandals, price spikes, and the exclusion of whole neighborhoods from the network. Residents of Veolia’s home turf Paris have also revolted against a longstanding privatized water management system, amid rising public frustration with high costs and “political ulterior motives,” according to TNI. Water has now been placed under the autonomous public governance of Eau de Paris, through a management plan based on “water solidarity,” which includes discounts for poor households and squats, and initiatives to promote conservation and organic farming. Even in the relatively wealthy US, partnerships with water multinationals have fueled outrage over corrupt dealings and incompetent service. From spilled sewage in California’s San Joaquin River to chemical contamination of a privatized water plant in Liberty, Missouri, privateers have been condemned for failing to invest adequately in local infrastructure and imposing unfair rates, while soaking up government subsidies for infrastructure development. Recently in New Jersey, the corporate service provider United Water has even opposed legislation requiring public notification for pending rate hikes and boil-water alerts. Water crises expose underlying inequalities. 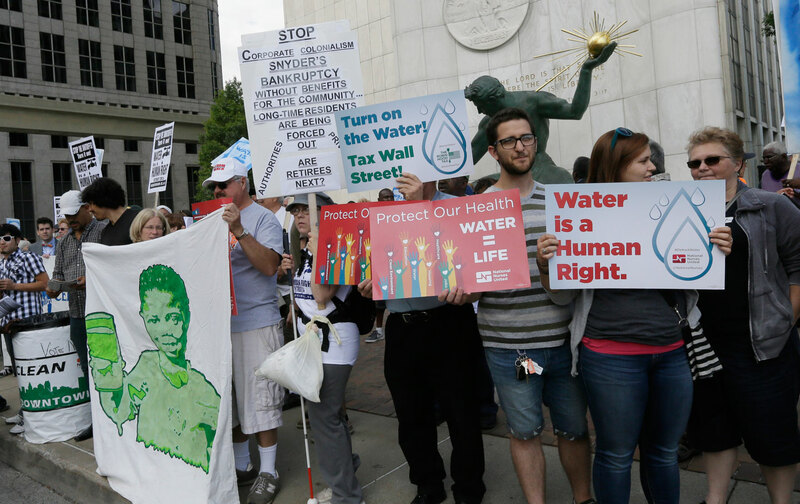 Detroit, a city plagued by white flight and deindustrialization, recently entered into a controversial consulting partnership with Veolia, which environmentalists call a “prelude to privatization.” The water crisis that culminated in mass water shut-offs last year has sparked a Thessaloniki-like anti-austerity movement across the embattled city, exposing the devastation imposed by austerity measures. Impoverished communities that have been the site of racial and economic unrest in recent months, including Baltimore and St. Louis, have also been the site of water conflict, with social strife coinciding with mass water shutoffs. When dealing with a basic resource like water, the possibilities for capitalizing on scarcity are infinite. Yet in times of crisis, growing awareness of the universal right to water can force communities to distill political power and level inequality.